Being a pillar of your community means both setting a good example and making the world a better place. Mirchi and Mime is a perfect illustration: the Mumbai restaurant employs an exclusively deaf and hard-of-hearing staff. This not only creates greater opportunities for a normally sheltered group, but it also provides greater understanding to the patrons that grace the dining room. It's a win-win that's delicious to boot. Mirchi and Mime serves reinvented Indian dishes in a fine-dining atmosphere off the beaten path. 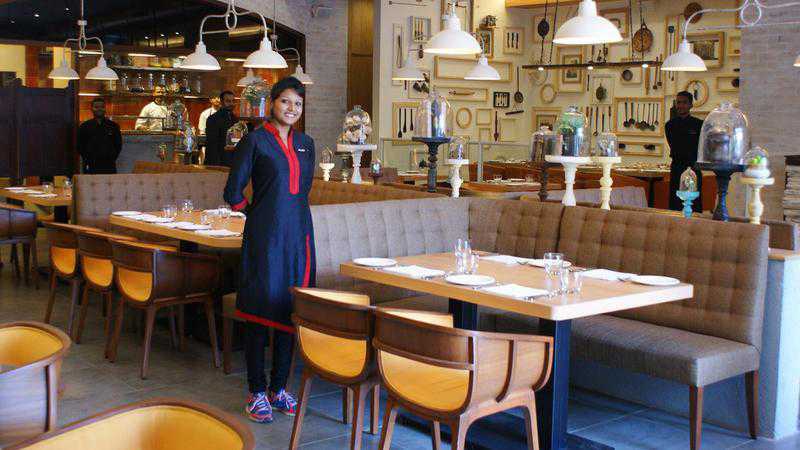 Owners Prashant Issar and Anuj Shah opened the restaurant as a way to spread happiness. "In addition to generating individual wealth, every business should generate wealth for society as a whole and be beneficial," Issar told Society Magazine. The team recruited students from a school for the deaf and hard of hearing and from an equal-opportunity job fair. Most of the new hires had little to no work experience, but after an eight-week long training and familiarity program, they were ready to go. So how do you dine at a deaf and hard-of-hearing establishment if you don't know sign language? The menu will help you along. As The Better India explains, "The process is simple—all menus list not only the food available, but portion sizes and other eating paraphernalia like salt, pepper, spices, sauces, and even cutlery. Every point of information has an accompanying illustration that depicts the hand-gesture for the same in sign language. Diners are required to simply mimic these hand-gestures to place their orders." As an extra safeguard, every plate comes with a placard that's labeled with the name of the dish. Mirchi and Mime provides two forms of community benefit. For one, they open new opportunities to a normally sheltered part of Indian society, not only giving them a new form of income but also putting them into contact with people they might not usually encounter. 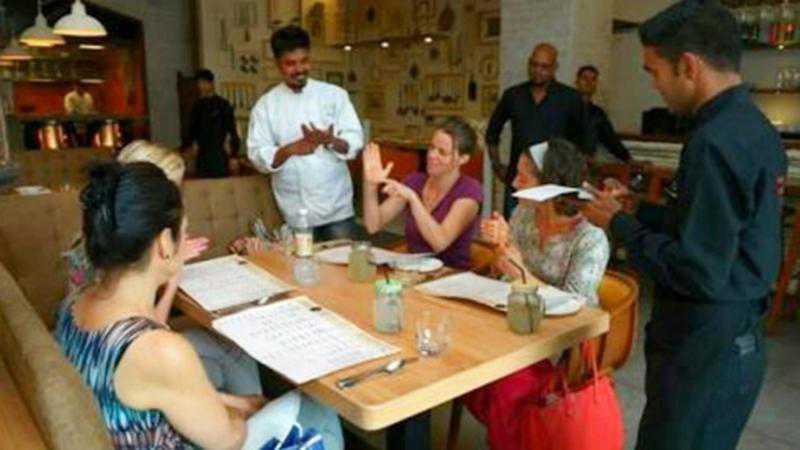 Secondly, it gives diners the opportunity to interact with members of their community whose handicap is overcome by the restaurant's unique approach. Mirchi and Mime isn't the first of its kind. 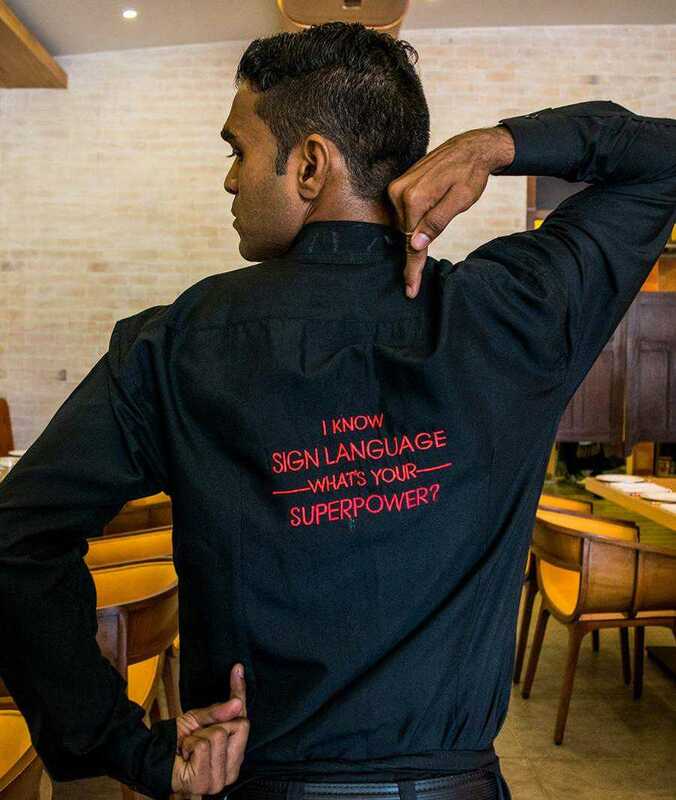 In fact, they took inspiration from Signs, a Toronto restaurant that also hired deaf and hard-of-hearing servers. Although Signs has since closed up shop, their efforts have echoed in Issar and Shah's menu of Indian flavors. There's also a pair of exclusive Canadian restaurants called O.NOIR, where an entirely blind waitstaff serves patrons in a pitch-black dining room. It's clear that when entrepreneurs hire people from the disabled community, it's not just the employees who benefit—it's everyone.